I’m sure you’ve noticed just how many portable chargers there are to choose from these days. Truth be told, there are so many to choose from that deciding on the best charger for keeping all your devices up and running can be a daunting task. I have always preferred the Anker line of portable chargers because of their exceptional durability and ease of use. That’s why I was excited to open my mailbox the other day and find that I’d received an Anker PowerCore Lite 20000mAh Portable Charger for review. Anker has always been known for packing a lot of storage capacity into a relatively small package, and so it is with this one. Although it’s about the size of am oversized smartphone, this particular Powercore Lite device can charge an iPhone 8 a total of seven times before you’ll need to recharge the battery in the charger. Have a iPhone X or a Samsung Galaxy S9? If so you’ll be able to charge your phone five times on a single charge! One thing I really love about this charger is how you can charge two devices at once. Simply plug a couple of phones into the dual-USB charging ports and you’ll be in business. I also like the versatility of this device. You can charge microUSB and USB-C devices as well as Apple devices that have Lightning connectors simply by using the cable(s) that matches your device(s). Note: This kit includes a microUSB charging cable. USB-C and Lightning cables must be purchased separately if you need them. Bottom line: If you’re looking portable charger that can keep all of your portable devices charged up and running for several days, I don’t think you’ll find a better solution than this handy jewel from Anker. 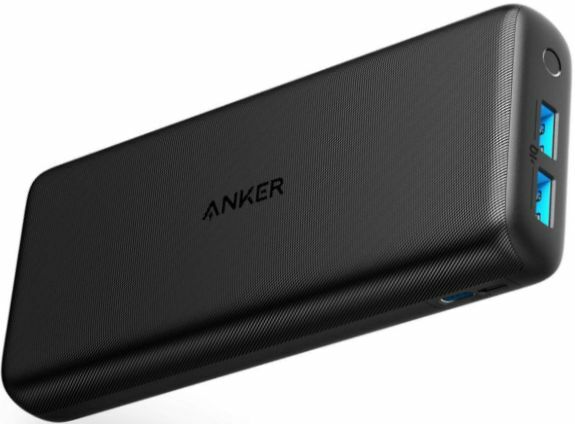 Click here to read more about the Anker PowerCore Lite 20000mAh Portable Charger at Amazon.